구글 never lies!. . HD Wallpaper and background images in the Critical Analysis of Twilight club tagged: twilight edward cullen funny cat. lol at "Edward Cullen is so beautiful I creamed myself". 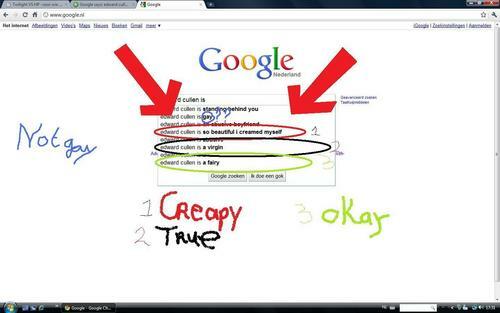 Note: I think you mean "creepy" instead of "creapy". 2 is fault, have you not read Breaking Dawn? It's google, not me. Try it! "Edward Cullen is so beautiful I creamed myself" is actually a Robert Pattinson quote. The entire quote was mocking how Edward was described 10 times on every page and how he felt SMeyer is infatuated with Edward. TrueTwi_hard, here's part of Robert Pattinson's interview. It's just the part with the whole "Edward Cullen is so beautiful I creamed myself."